Keen Koala: What are the cheapest Products At L'Occitane? 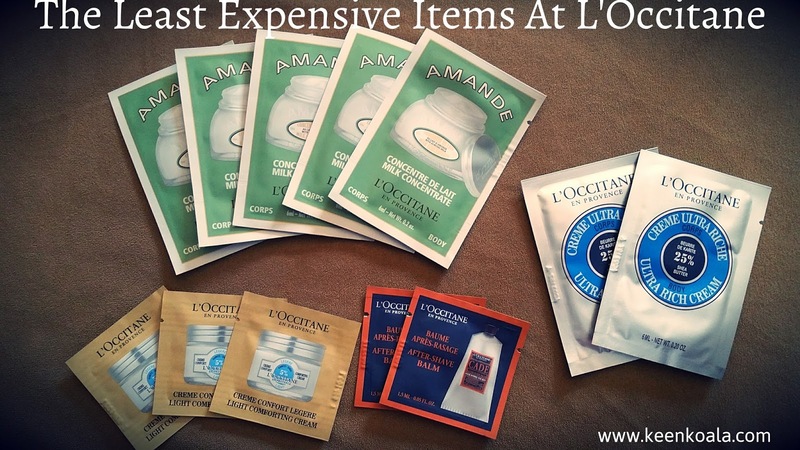 What are the cheapest Products At L'Occitane? Every once in a while L'occitane puts out coupon codes for awesome free gifts + free shipping with any purchase and free samples. So you may be wondering what the cheapest thing to buy at L'Occitane is. The cheapest thing I found is a set of diffuser sticks for $5 USD. However this item is not at all useful to me. So let's check out some other inexpensive items. They also have 2 bar soaps which are $6 a piece. The beautiful men's soap L'HOMME COLOGNE CÉDRAT SOAP and the ALMOND DELICIOUS SOAP which is an amazing exfoliating soap. I would definitely recommend these soaps. The last item I found for $6 is the APRICOT FRAGRANCE ULTRA SOFT SOLIDARITY BALM which is a multi purpose balm to nourish lips, skin, and hair. As with any business product lines and prices at L'Occitane are subject to change but as of right now in 2018, those are the cheapest items I could find on their website. Combine an inexpensive item with a promo code for a free gift + no minimum free shipping and you will have yourself a nice little haul of products for a fraction of the retail price. And don't forget to select your 3 free foil samples at check out! If you enjoyed this post, please follow Keen Koala on Facebook by clicking HERE!